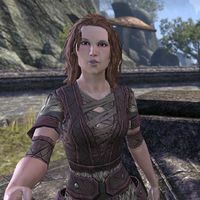 Axulfa, as seen in Mournhold. Axulfa Giant-Slayer is a Nord warrior found in the city of Windhelm. She can also be found in Mournhold, helping Rigurt the Brash. "If Rigurt sent you, you're wasting your time." "You must know of the glorious Nord Cultural Exchange! But our important work is delayed by... bureaucrats!" "Your dumbness is charming, but while Rigurt waits by the City Center, Axulfa has decided to see the sights of the Dark Elf metropolis." This page was last modified on 1 August 2018, at 02:07.